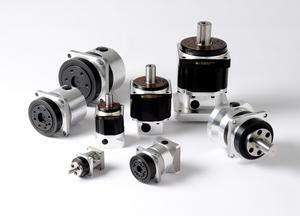 Quick Connect® Servo Gearheads offer Permanent Precision, Excellent Backlash Stability. Harmonic Planetary® and Harmonic Drive® gearheads are available with a wide range of gear ratios and torque capacities. HPN Planetary gearheads feature a robust design utilizing helical gears for quiet performance and long life. These gearheads are available with short lead times and are designed to couple to any servo motor with our Quick-Connect® coupling. This new value series of planetary gears carry the reputation for quality and reliability for which Harmonic Drive® products are known throughout the world. HPN Harmonic Planetary® gears are available in 5 sizes, with reduction ratios ranging from 3:1 to 31:1. HPG and HPGP Quick Connect® gearheads offer high precision and low backlash (standard: < 3-arc-min, optional: <1 arc-min). Innovative ring gear automatically adjusts for backlash, ensuring consistent, low backlash for the life of the gearhead. Standard (HPG) and high torque (HPGP) versions are available. With reduction ratios ranging from 3:1 to 50:1, HPG and HPGP HarmonicPlanetary® gears are each available in 6 frame sizes. HPG is also available in 3 sizes as a right angle configuration. CSF-GH and CSG-GH Quick Connect® gearheads with zero-backlash Harmonic Drive® gearing are available with high reduction ratios, 50:1 to 160:1. CSF-GH and CSGGH utilize our proprietary S tooth profile and provide high precision positioning (repeatability ±4 to ±10 arc-sec). The greatest benefit of HarmonicDrive® gearing is the weight and space savings compared to other gearheads because it consists of only three basic parts.